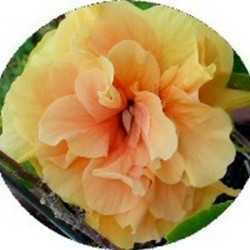 Most gardeners are familiar with propagating flowers and shrubs by taking stem cuttings. Many of you may not think about using the same procedure to create more plants for the vegetable garden. By following the same basic steps you can create more plants in short order. Have you ever visited a friend's or neighbor's garden and contracted tomato envy? This condition is when you see a variety of tomato that you must have but you're at a point in the growing season where there's not enough time to start a new plant from seed. The garden center has sold out of their transplants. Well...you can have that tomato plant. By taking a stem cutting you can have a plant ready to set out in your own garden within a couple of weeks. If it's an heirloom or open-pollinated plant you can save the seeds and produce the variety for years to come. If the variety you yearn for happens to be a hybrid, cuttings are the only way that you can reproduce that particular plant. Hybrids will not grow true from their seeds; they revert to one of the parent plants. Tomatoes are easy to clone from stem cuttings because the cells in the stems will turn into roots.I like to us suckers as my source of cuttings. A sucker is a stem that grows from the point where a fruit producing stem joins with the main stem. 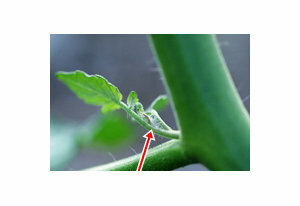 There are several forms of medium in which to start your cuttings. I prefer Pearlite. It's is readily available and inexpensive. It is light and airy which allows the roots to receive plenty of oxygen. You can also use sand, vermiculite, or a seed starting mix. I use a plastic shoebox from the dollar store. Fill the shoebox with pearlite and add water to within ½ inch of the top. Let set for several hours and carefully pour off any excess water. The pearlite should be damp but not soaking wet. 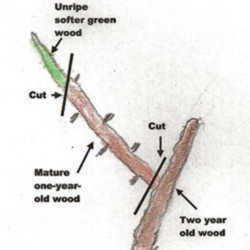 Using a sharp knife or pruners cut off the sucker where it meets the main stem. If you are not going to place it in the medium right away place the cut end into several layers of damp paper towel. This will keep the cutting viable for several hours. Dip the first inch or two of the cutting into the rooting hormone or honey. Using the pencil or screwdriver make a hole in the pearlite and carefully insert the cutting. Gently push the pearlite back around the stem. Keep the medium moist but not soaking wet. Keep the box in a warm sunny location. In 10-14 days, gently pull the cutting form the pearlite. You should see substantial root growth. Your new plants are ready to go out to the garden. Plant them as you would any transplant and keep well watered. Paul Rodman has been gardening for over 45 years. He is an Advanced Master Gardener, and American Rose Society Consulting Rosarian. He is President Emertius of the Western Wayne County Master Gardener Association in Wayne County, Michigan. He currently serves as the greenhouse chairman of this group. Rodman has amassed over 5500 volunteer hours in the Master Gardener program. 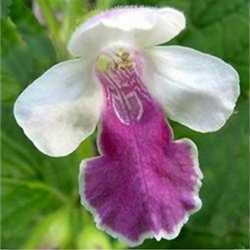 Rodman is the garden columnist for The News Herald newspaper, in Southgate, Michigan. He has also written for the Organic Gardening.com web site. He is a certified Master Canner and has taught classes on Home Food Preserving for 7 years. He has lectured on various gardening topics throughout southeastern Michigan. His favorite pastime is teaching children about gardening. For the past several years he has conducted classes for second grade students teaching them about subjects ranging from vermi-composting to propagation.